Linking up with the fine FLAP ladies. It's Gaudete Sunday, y'all: give it up for pink. Err, rose. I feel a little like a pink Advent candle in this getup, but it seemed appropriate. And thank heavens for the probably too-long skirt, because the velcro on Joseph's shoes snagged my nylons above my knee during the homily and a silver dollar sized hole ensued. Modesty for the win. At the height of frustration I shouted WHAT'S THE POINT OF HAVING CHILDREN IF THEY WON'T SIT AND SMILE FOR A CHRISTMAS CARD PICTURE?!?!? And everyone in the room took a few steps back from me so as to not get zapped when the lightning struck. It took a youtube video playing on someone's phone, eight mint M&Ms, and endless pretend sneezes but we did get one with both boys looking forward and slightly smirking. And everyone's welcome to join me at confession next Saturday. haha I hear you on trying to get kids to sit still for pictures. Your husband is obviously also finding that hilarious! You wear that color so well. Such a classy look. 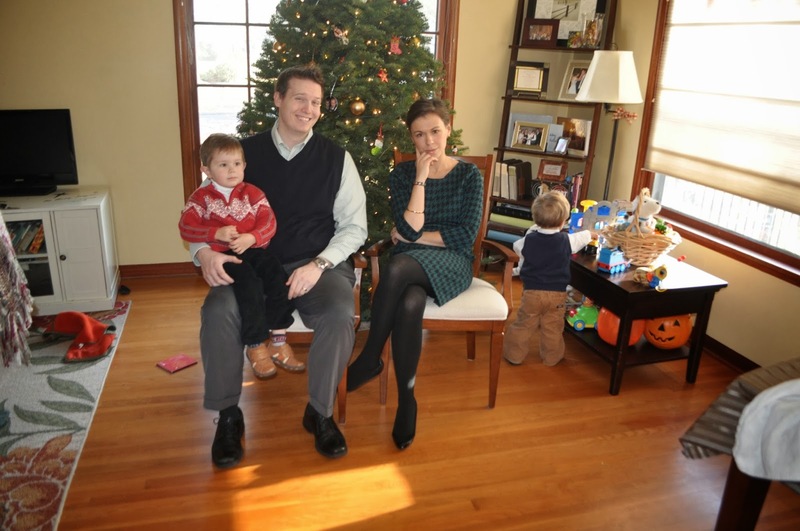 And I have to laugh about the Christmas card photo, because…RIGHT?!?!? !